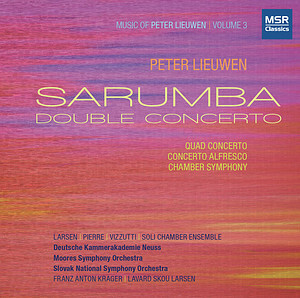 Peter’s new orchestral CD SARUMBA has been released on the MSR label. The world premiere recordings feature artists Lavard Skou Larsen, Emeline Pierre, Allen Vizzutti, and the SOLI Chamber Ensemble performing concertos with the Deutsche Kammerakademie Neuss and the Moores Symphony Orchestra. Franz Anton Krager conducts the CHAMBER SYMPHONY with the Slovak National Symphony Orchestra. SKYLINES for saxophone quartet is the title track of a new CD released by the Iridium Saxophone Quartet on Blue Griffin Records. Recent international performances include the world premiere of LITTLE RIVERS for oboe and alto sax commissioned and performed by the Three Reeds Duo at the World Saxophone Congress in Zagreb, Croatia and a performance of BRIGHT RIVER for clarinet and piano with clarinetist Malena McLaren at Clarinetfest in Brussels, Belgium.